Soon after we woke today it started snowing heavily. At 8pm, it was still snowing! However at 9pm we saw a fantastic sunset – see photo with our tent in the foreground. 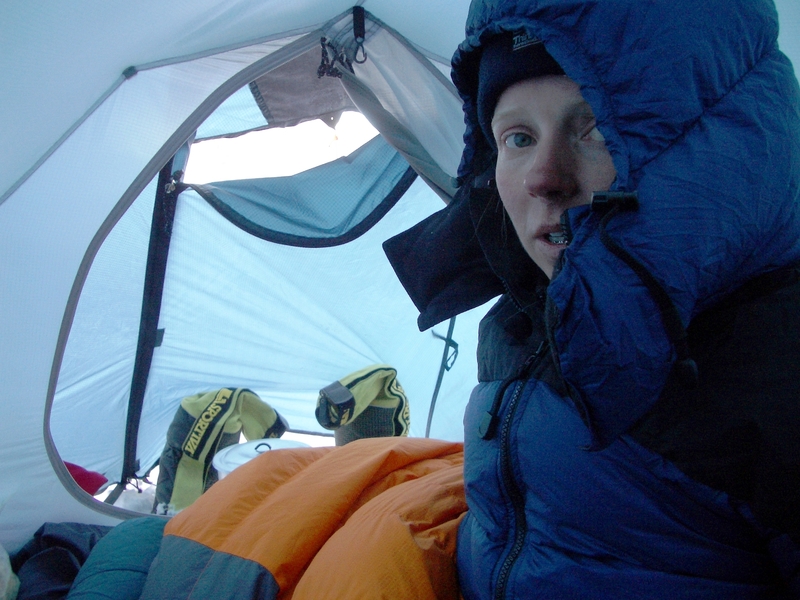 Given the bad weather today we had another rest day – mainly spent snoozing in our tent. We cooked up a tuna pasta for lunch – and that was the highlight of the day. We are also getting a little concerned that there are no confirmed reports of anyone summiting yet. This may mean that the fixed ropes near the top have not yet been replaced from last year (and would probably be very difficult to find after a whole winter of snow). We are now debating whether to go ahead as soon as the weather clears, or whether to wait another day or two for one of the large guided groups to go ahead. Anyway, we now have plenty of supplies here to last us quite a while.